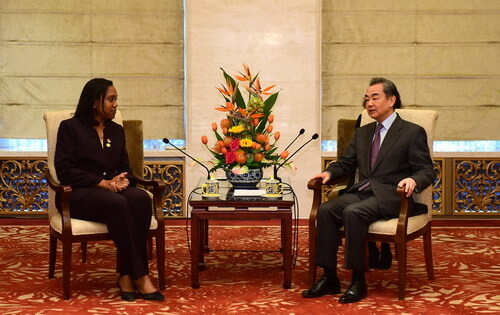 On February 21, 2019, State Councilor and Foreign Minister Wang Yi met in Beijing with Minister of Foreign and CARICOM Affairs Francine Baron of the Commonwealth of Dominica who came to China for the seventh round of consultations between the Ministry of Foreign Affairs of China and the Ministries of Foreign Affairs of the Caribbean countries having diplomatic relations with China. Wang Yi expressed that relations between China and the Commonwealth of Dominica have achieved sound development based on the one-China principle. This year is crucial for bilateral relations to inherit the past and usher in the future as it is the 15th anniversary of establishment of diplomatic relations between the two countries. Both sides should sum up experiences, look forward to the future, and especially seize the opportunities brought by the joint building of the Belt and Road Initiative to expand new space for bilateral mutual beneficial cooperation. Francine Baron noted that China is a good friend of the Commonwealth of Dominica and the countries in the Caribbean region. The Dominican side thanks the Chinese side for supporting the development of the Commonwealth of Dominica and the countries in the Caribbean region and especially the valuable help China offered to the Commonwealth of Dominica during the hurricane disaster. The Dominican side supports the one-China policy and the Belt and Road Initiative, and believes that the joint building of the Belt and Road Initiative will provide great opportunities for the development of the Commonwealth of Dominica and other countries in the Caribbean region. The Dominican side hopes to strengthen coordination and cooperation with the Chinese side on issues including climate change.